This week I’ve favored the word “melancholy,” not quite feeling sad, not quite feeling happy, not quite sure what I want, conflicted, comfortable, and on edge all at the same time. This melancholy state has allowed me to take a few moments of introspection and reflect upon my goals, my hopes, and my confidence. 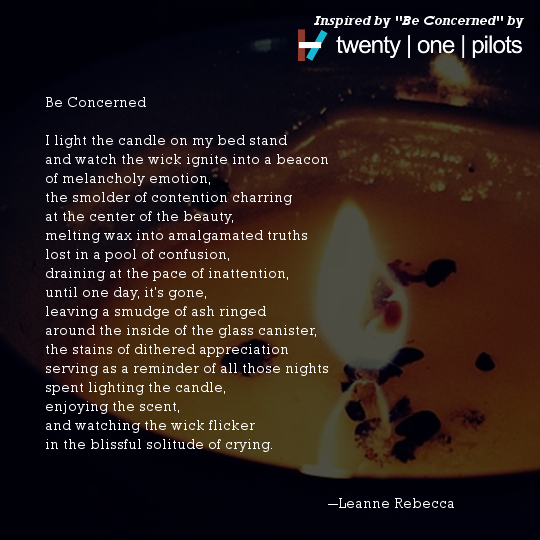 Hearing the Twenty One Pilots song “Be Concerned” this morning, I felt drawn to the dichotomy of the music: the sense of purity that contrasts with the raw verse of the rap. I listened a couple times, and then before even perceiving that I’d picked up a pen, I’d written a poem. Thanks for stopping by. If you have a second, check out the archives of all my Twenty One Pilots inspired poetry and give a listen to their music below. Also, I’d love to hear your thoughts in the comments. What are you feeling conflicted about right now?